With a plunging reputation and enrollment rate, Saint Michael's has become a crumbling dumping ground for expelled delinquents and a haven for the stridently religious when incoming freshman Peter Davidek signs up. On his first day, tensions are clearly on the rise as a picked-upon upperclassmen finally snaps, unleashing a violent attack on both the students who tormented him for so long, and the corrupt, petty faculty that let it happen. But within this desperate place, Peter befriends fellow freshmen Noah Stein, a volatile classmate whose face bears the scars of a hard-fighting past, and the beautiful but lonely Lorelei Paskal —so eager to become popular, she makes only enemies. ANTHONY BREZNICAN was born and raised in Western Pennsylvania and attended Catholic school for 13 years – longer than some of his teachers would have liked. He graduated from the University of Pittsburgh in 1998, and went on to work as a reporter at The Arizona Republic, Associated Press, and USA Today. He is currently a senior staff writer for Entertainment Weekly, and lives in Los Angeles with his wife, a librarian, and their two children. Brutal Youth is his first novel. 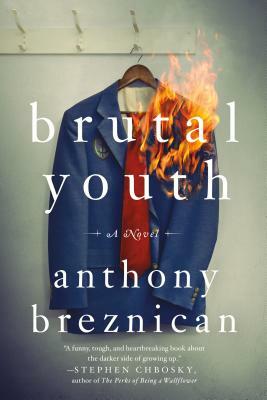 “Breznican has accomplished that rare feat of unflinchingly exposing the high school experience in all of its hilarity, vengeance, and terror. You'll think Roald Dahl just went for a swim in the world of John Hughes and came out wearing prison stripes. Life isn't fair... but high school is brutal.